The Good Return Sustainable Energy Program in Timor-Leste has been progressing in leaps, bounds and land-slides and has been both extremely challenging and very enjoyable. It is now at the stage where it will begin to transition to Moris Rasik so they can continue to run with the program in the New Year. One of my first tasks on the program was to get the Memorandum of Understanding between Good Return, Mercy Corp and Moris Rasik signed. Progress on this task leaped ahead, with the initial drafts being vetted by Will Barron the Mercy Corp Energy 4 All Program Manager and myself. Then the drafts entered the review processed and land-slided for a while since the Mercy Corp Country Director was on leave for 6 weeks. Not to worry, there was plenty of other work to do! Rest assured, the MoU is signed! Next was the need to determine which districts in Timor-Leste would be most appropriate for MR to focus on in the early days before expansion nationally. MR senior management feedback on the factors to assess was obtained quickly and easily at the regional manger meeting. Leap. This then necessitated a lot of running around trying to find information to assess these factors. The info should have been easily available but wasn’t. Landslide. 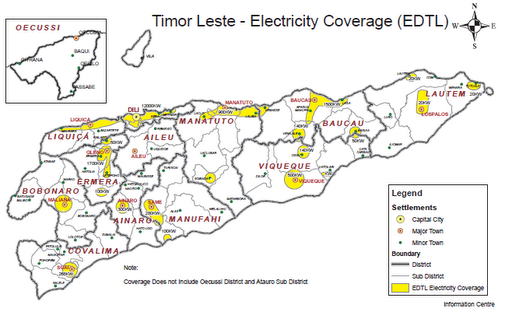 An example was the Timore Leste Rural Electrification Master Plan (REMP). In the end even the Director General of the Secretaria de estado da politica energetica (Secretariat of state for energy policy) was calling me to try to get a copy of this report! Combined eventually with sunlight data from NASA, electricity coverage courtesy of UNDP and client data from Moris Rasik we nearly had all the information we needed. Having identified the districts we thought would be good for business we needed to determine if the people in the districts we had selected wanted the products and could afford them. It took 3 weeks to get approval and arrange the trip with numerous Timor style reschedules. Landslide. Then ensured a week long motorbike journey into the districts of Ainaro and Manufahi, our top 2 rated districts. Bound. 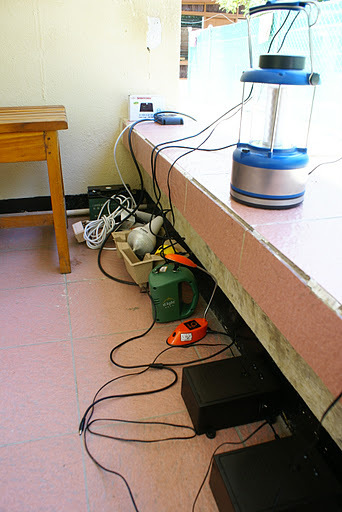 The trip revealed the reality – none of the 98 clients interviewed had access to grid electricity. Moris Rasik clients were spending on average $4 a week on candles and kerosene. 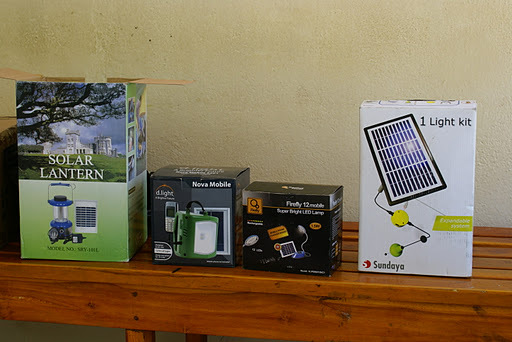 The results of the energy needs assessment were over-whelming , clients wanted, needed and could afford the type of solar lighting products we wanted to give them. You can read all about this trip here and you can read the Energy Needs Assessment report here. 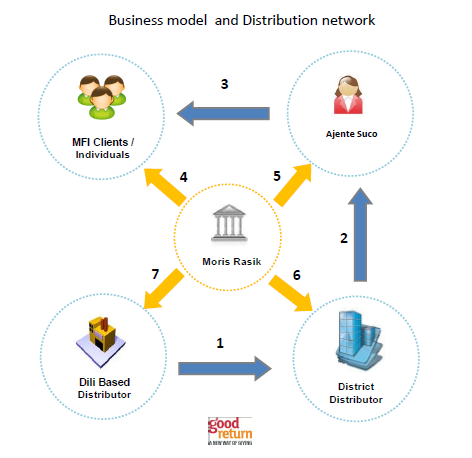 With the field set, all that remained was to develop a loan product specifically for the purchase of Solar products, a mechanism to ensure the clients would buy the solar product with the loan, create a distribution network and select some products, as per the business model below. Leap, Bound, Landslide, Repeat. Working with the Operations Manager at Moris Rasik we sketched out the details of the loan product and started it on the path to approval. Not so bad. Then came the voucher system – on first go it was far to complicated and we started again, and then revised it again and again with Mercy Corp input. It looks beautiful now. After a month of work these processes are sitting waiting for the right day to shine. They got their first glimpse of sunshine at the recently held Programma Ahi Baa Uma Information memo session in Maubesse. To get the ball rolling on the distribution network we met with a range of local businesses that focus on electronic products and carefully narrowed down the choice to 3. These 3 are our potential ‘Importadors’. Product selection has proven to be a lot tougher. We collected a range of Solar products form our 3 importadors and from internationally recognised sources such as Barefoot, D-light and Sundaya and consulted with Origin Energy to determine the best way of assessing the product for our purpose. Our partner Mercy Corp also sent a number of products away to be tested in detail as well as conducting some field testing. We decided to take the products on a road-show to see what clients thought of them, and you can read all about that in this blog post. During this trip we also met with and interviewed clients and shop-keepers who are interested in becoming ‘District Distribuidors’. In Late Novemeber we will be returning to identify the ‘Ajente Sucos’ or Sales Agents for the areas as well. 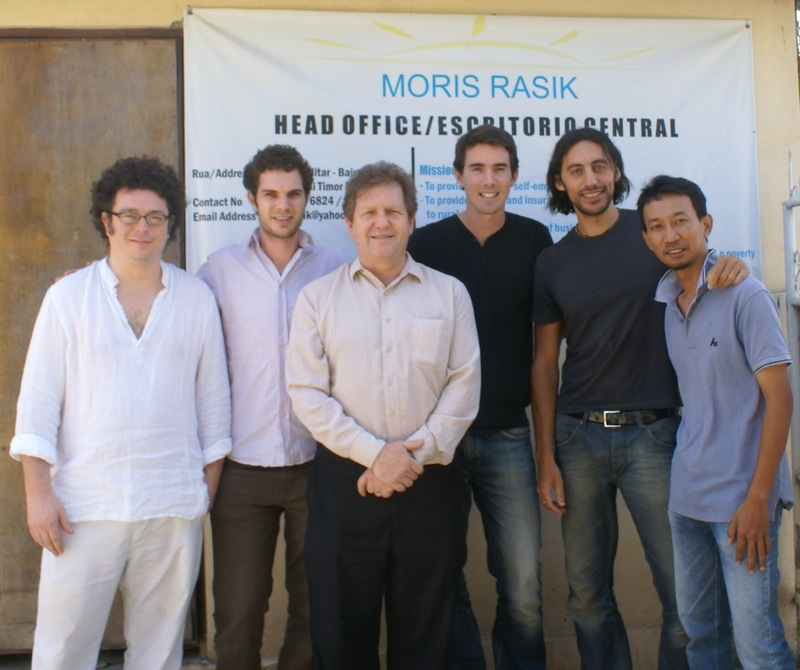 In the New Year, Moris Rasik and Mercy Corp will be bringing them all together to discuss how they will work together to supply and service solar lights in the regional areas of Timor Leste. I got my helmet back! Congrats mate, its nice to see all your hard work starting to produce some positive results. Really impressive what you've achieved in such a short time. Now keep the momentum going! Thanks all. Its not all tough, the friendly shouts of “Malai, Malai” from the wide eyed kids is pretty nice too. Not so sure about the two that starting pointing and touching the hair on my toes though, but at least they thought it was pretty funny! Good work Damian sounds like progress!